CCB #190503 Se Habla Español! 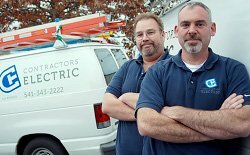 At Contractors Electric, we believe that hiring Eugene electricians for your home or business should and must be a positive and rewarding experience. We know that our success is determined by our performance; therefore, we hire only skilled, licensed Eugene electricians who enjoy their trade and take pride in the quality of their work. That is why our Eugene electricians are trained professionals with the knowledge that is necessary to ensure the utmost safety of your electrical system within your home or business. 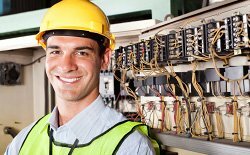 Contractors Electric is a full service electrical contractor. We offer design and build, new installations, remodels, and repair services for most electrical systems.